Demand Outstrips Supply Yet Again! 2013 was another great year for Buy to Let investors, with the demand for rental properties outstripping supply and rents increasing. The average rent paid by tenants in Britain increased by 2% in 2013 to £854 a month, according to property firm Countrywide. Tenants have been squeezed by rising prices, with many unable to access mortgages or raise the sums needed to buy a property. The so-called “generation rent” have found themselves trapped in rental housing for longer and driving up demand for rented homes. There are signs that the increased availability of loans for those with small deposits are allowing people to leave the rental market, which could cause rents to fall, but Countrywide said the number of prospective tenants was still outstripping supply in some areas of the country. It said the increase in rents was broadly in line with the 1.9% rise in the median full-time incomes reported by the Office for National Statistics, but in some areas of the country pay lagged behind. The figures, which are based on analysis of 50,000 rental properties, showed the biggest rent rises during 2013 were in Wales, where the average amount paid went up by 3.8%. However, it is still one of the cheapest areas in which to be a tenant, with an average monthly rent of £632 and a median income which increased by 4.8% over the same period. 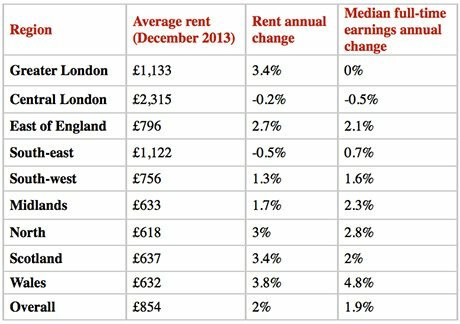 In contrast, in Greater London, where rents went up by 3.4% over the year, median incomes were flat and the average rent stood at £1,133 a month in December. In central London, Countrywide said costs had dipped by 0.2%, but the average monthly cost of renting still came in at £2,315. Nick Dunning, group commercial director at Countrywide, said: “2013 saw the focus of demand shift sharply northwards after several years of more stable levels of supply and demand. The Royal Institution of Chartered Surveyors has forecast that UK rents will rise by 2% in 2014.